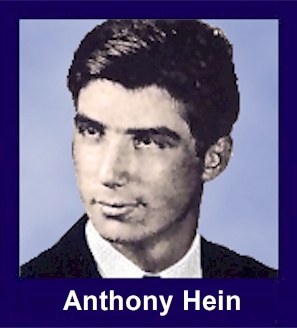 The 35th Infantry Regiment Association salutes our fallen brother, PFC Anthony V. Hein, who died in the service of his country on August 7th, 1968 in Darlac Province, Vietnam. The cause of death was listed as Small Arms/AW. At the time of his death Anthony was 22 years of age. He was from Verona, New Jersey. Anthony is honored on the Vietnam Veterans Memorial at Panel 49W, Line 23. The decorations earned by PFC Anthony V. Hein include: the Combat Infantryman Badge, the Bronze Star, the Purple Heart, the National Defense Service Medal, the Vietnam Service Medal, the Vietnam Campaign Medal and the Vietnam Cross of Gallantry with Palm Unit Citation. I am sorry that I haven't written in a week but I really haven't had the chance. We've really been on the go. It's the new Captain we have. All new Captains seem to be gung ho. Right now it must be about dawn in West Virginia. I hope that you are having a good time there. We are still in the same area that we were in last time that I wrote. We've been going out and coming back. One day we were choppered out and checked this area that had been repeatedly bombed the day before. We found nothing but large craters. We walked all day until it was too late to go back to our camp. So some of the packs were dropped off for us by helicopter. There was one poncho for every couple of men and it rained like the dickens that night. Sgt. Hogan and I slept together What we did was just use the poncho as a blanket and laid it on the tall grass and we were warm even though we were soaked. The next morning we dried out by fire. We stayed out in the boonies there for a few days being helicoptered occasionally from one spot to another. On Saturday a bunch of us really got the daylights scared out of us. I was walking in the rear of the patrol at the time. The front had reached this thick treed area that looked suspicious enough to recon by fire. Which means to check the area by standing a good distance back and firing in with a machine gun. It's a safe and effective way to see if there is anyone in there. The trouble was that they didn't pass the word back to the rear or even up to the front. When we heard the machine gun fire in the middle of the patrol, naturally we hit the deck pronto -- hearts pounding. In about 15 seconds we found out what happened but it was a long 15 seconds. We were certainly getting funky out there in the field getting rained on and sweating through our clothes. One day we even had to trudge through this narrow little bank that was so steep one of the bigger guys was left on either side yanking us up. I forded across the thigh high river with "Flame" in front of me. When we got to the opposite bank "Foots" ( size 13, ya know) was pulling and I was pushing and "Flame" was like a water buffalo. When we had to come back across the river the following day we used our heads and crossed on a log about 15 feet down stream. I like the Montagnard villager people in the area. They don't beg but trade with you. We give them a can or two of some C-rations that we don't want anyway and they'll give you fresh picked ears of corn. Yesterday our company and a whole army of other companies were checking out these hills. We finally got clean clothes today and we got the opportunity to bath in a stream this afternoon. I feel like a new man. Good food is something that I think about a lot over here. I can't wait to sit down to a good Italian dinner, a steak, French fries, onion rings and ice cold beer with ice cream for desert. It was very flattering of you to suggest that I write to the Verona-Cedar Grove Times but really nothing exciting is happening to us. Our greatest excitement is sitting around counting the days and sometimes for kicks we watch the corn as it grows. I'll think about it though. "Short" is the most popular saying in Vietnam. It refers to your time here. To be truly short you must have less time left than you have been here. In other words, after 6 months you are going down hill and then your time is short. When I was back in Pleiku training everybody who could see that we were brand new would be shouting "short" at us. When a new man comes in it really makes you feel good because you are getting shorter. We got a critical breakdown of 5 beers and 5 sodas today. Ten cans for man and I'm ready to hit my goody bag again. Well take care. Don't let any of those horses throw you. Tell me how your West Virginia Vacation was. Cpl Hein, who lived at 28 E. Lincoln St was a lifelong resident of Verona. The 23 year old soldier who was in Vietnam since April died Wednesday August 7 of wounds received while engaged in a firefight, according to a telegram from the Army. He had been stationed in Cam Rahn Bay and Pleiku. A member of Company D of the 4th Infantry 3rd Bde. He entered the service in November 1967 and had taken basic training at Fort Dix. He had been stationed at Ft. Polk, LA before going over seas. Cpl Hein was a 1964 graduate of Verona High School and had been employed at General Motors in New York. He attended evening classes at Farleigh Dickinson University, Rutherford and majored in business for 3 years before he was drafted. He was a member of Our Lady of the Lakes Church, Verona. Besides his parents, Mr. And Mrs. John Hein Jr. he leaves a brother, John Hein III of Lake Hiawatha, a sister, Margaret at home, His paternal Grandmother Mrs. Katherine Hein of Verona, and his maternal grandfather Mr. Anthony Scott of Tenafly. I met Tony back in 1966 when we both worked for General Motors in NYC. One recollection of that distant time is remembering the conversations Tony and I would have regarding girls (Tony liked a pretty brunette co-worker who unfortunately had a steady beau)...And the conversations we would have in the G.M. We had many great years as kids growing up on E. Lincoln Street in Verona. You were known as "Tubby" then. I was 7 and you were 8.5 when we first met and became friends. We went to OLL school until I transferred to Forest Ave. school. We had a lot of fun playing in the street walking everywhere we went even to Montclair and neighboring towns. We spent a lot of time in your 3rd floor bedroom playing games and listening to music. We played cards in the backyard during the summers with your Grandmother and great aunt. You spent summers in Maine while my family went to the Jersey shore. Those were great days. I miss you and think of you often and also of your Mom and Dad, brother Johnny, sisters Barbara and Margaret. I cant believe it has been almost 40 years since we lost you my good friend. I look forward to the day when we meet again. Private First Class Hein distinguished himself by outstanding meritorious served in connection with ground operations against a hostile force in the Republic of Vietnam. Through is untiring efforts and professional ability, he consistently obtained outstanding results. He was quick to grasp the implications of new problems with which he was faced as a result of the ever-changing situations inherent in a counterinsurgency operation and to find ways and means to solve those problems. The energetic application of his extensive knowledge has materially contributed to the efforts of the United States mission to the Republic of Vietnam to assist that country in ridding itself of the communist threat to freedom. Private First Class Heins initiative, zeal, sound judgment, and devotion to duty have been in the highest tradition of the United States Army and reflect great credit on him and on the military service.